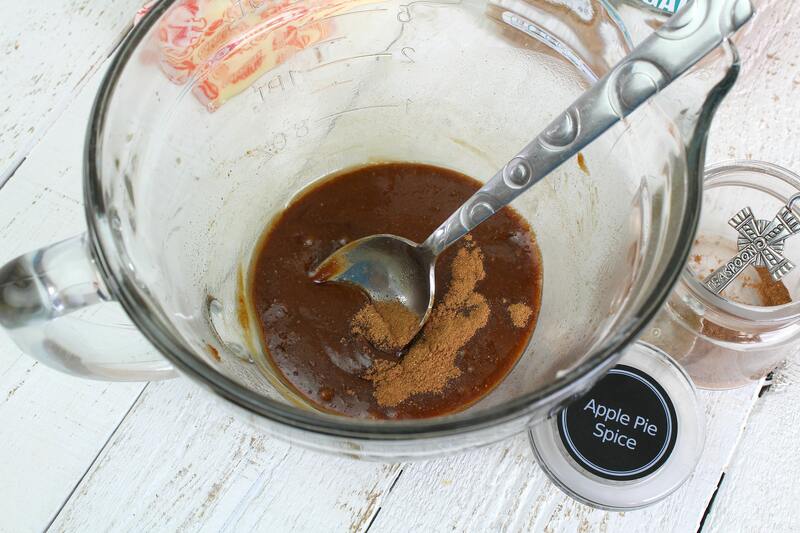 There is just something about apples and apple pie spice in the fall that makes my heart sing. I love all the seasons here in South Dakota, but my favorite is fall. The weather, the colors, and the flavors are something I look forward to all year. This type of recipe may be new to you, but I am sure we are all familiar with blooming onions from a popular restaurant in most of our towns. The concept is pretty much the same with this apple recipe aside from the fact there is no breading or frying. This Bloomin’ Apple recipe only uses 5 ingredients and is fairly healthy. I prefer to use coconut sugar, but brown sugar works just as well. When the apples are baked you can serve with a scoop of vanilla ice cream on top, a drizzle of caramel, and a sprinkle of cinnamon or apple pie spice. 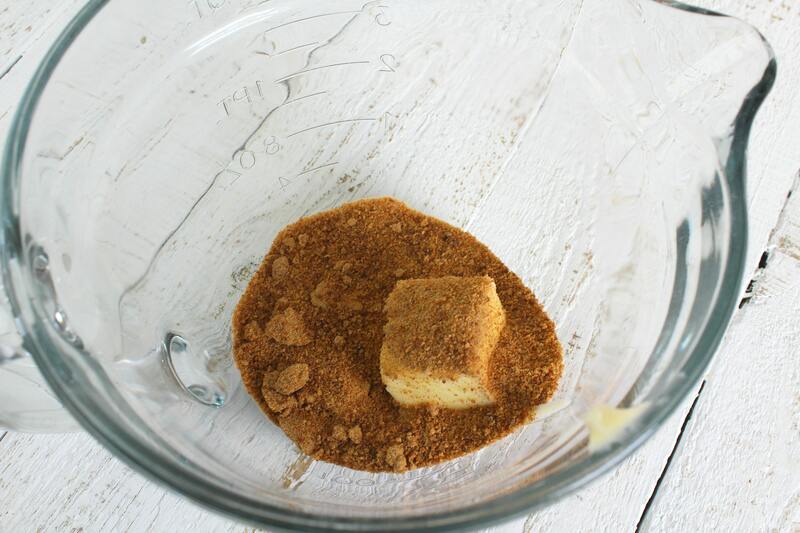 Step 1: Place butter and coconut (or brown) sugar in a medium-sized bowl. Microwave until butter is melted. Stir sugar and butter together until combined. Step 2: Stir in 1 tsp apple pie spice (or less depending on your affection for cinnamon and fall spices) to the mixture of sugar and butter. Step 3: On a cutting board, cut the top 1/4 of the apple off. Step 4: Scoop out the core of the apple with a knife and spoon (a grapefruit spoon works well). You can also use a melon baller to do this. Step 5: Next, with a thin small knife make two circular, deep cuts around the center of the apple. Try to not break through the skin of the apple. Step 6: Then flip over the apple so it is resting on the cut end. 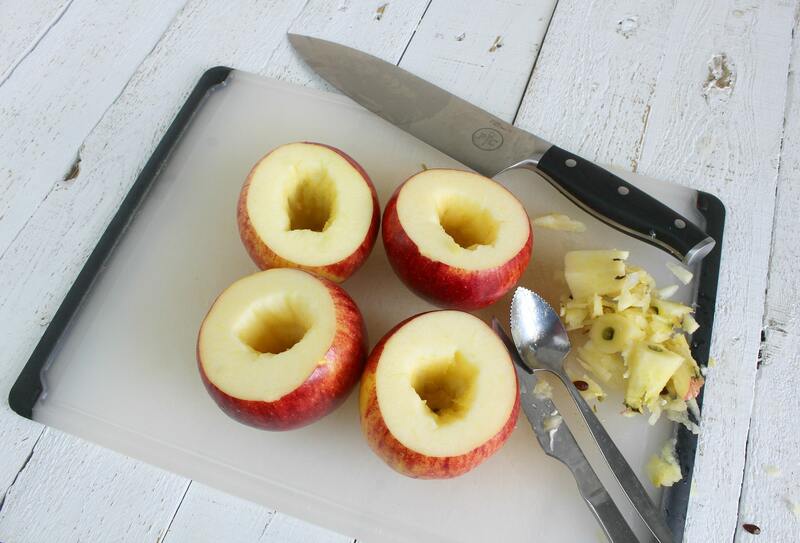 Make narrow cuts all the way around the apple. 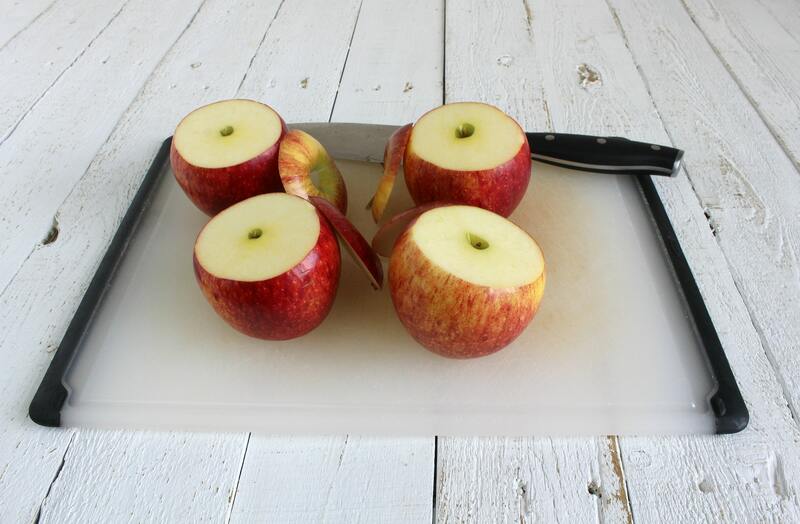 Step 7: Place apples in a greased 8×8 baking dish. Step 8: Distribute the sugar mixture evenly between the 4 apples. 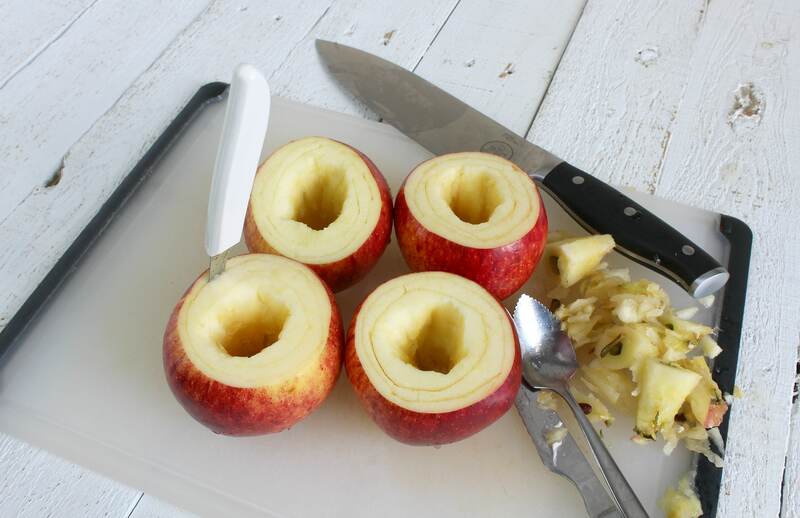 Cover the entire tops of the apples, not just filling the core of the apple. Step 9: Bake prepared apples at 375F for 45 minutes or until apples are soft. 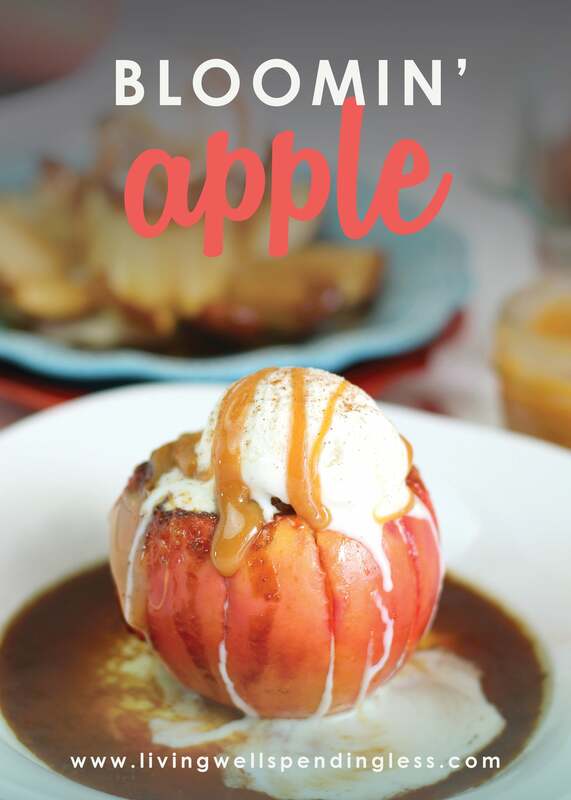 Let apples cool slightly and top with a scoop of ice cream and drizzle with caramel sauce if desired. This recipe may be new to you, but I am sure we are all familiar with blooming onions from a popular restaurant in most of our towns. 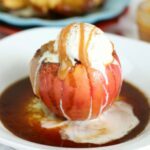 This Bloomin' Apple recipe is basically the same concept and only uses 5 delicious ingredients and very little effort! Place butter and coconut (or brown) sugar in a medium-sized bowl. Microwave until butter is melted. Stir sugar and butter together until combined. Stir in 1 tsp apple pie spice (or less depending on your affection for cinnamon and fall spices) to the mixture of sugar and butter. On a cutting board, cut the top 1/4 of the apple off. Scoop out the core of the apple with a knife and spoon (a grapefruit spoon works well). You can also use a melon baller to do this. Next, with a thin small knife make two circular, deep cuts around the center of the apple. Try to not break through the skin of the apple. Then flip over the apple so it is resting on the cut end. Make narrow cuts all the way around the apple. 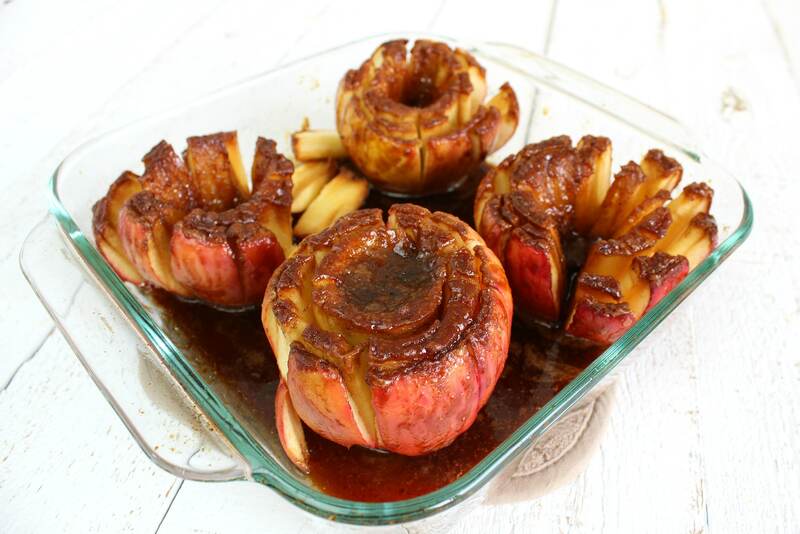 Place apples in a greased 8x8 baking dish. 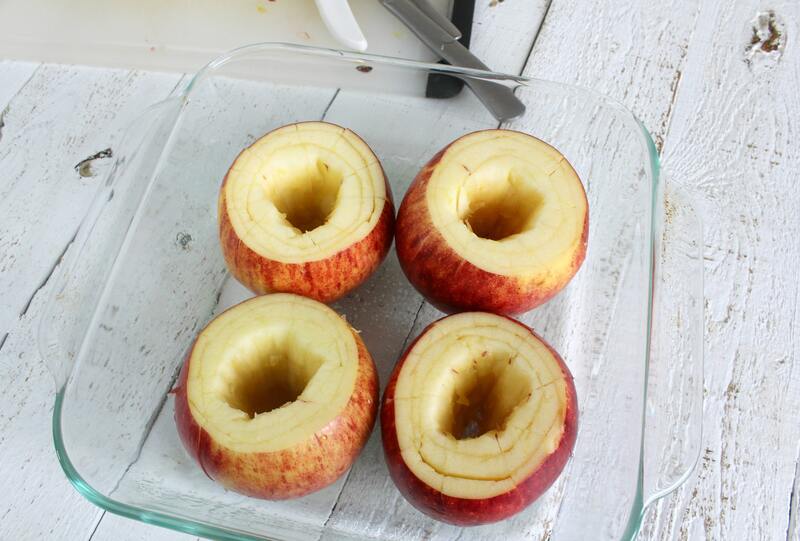 Distribute the sugar mixture evenly between the 4 apples. 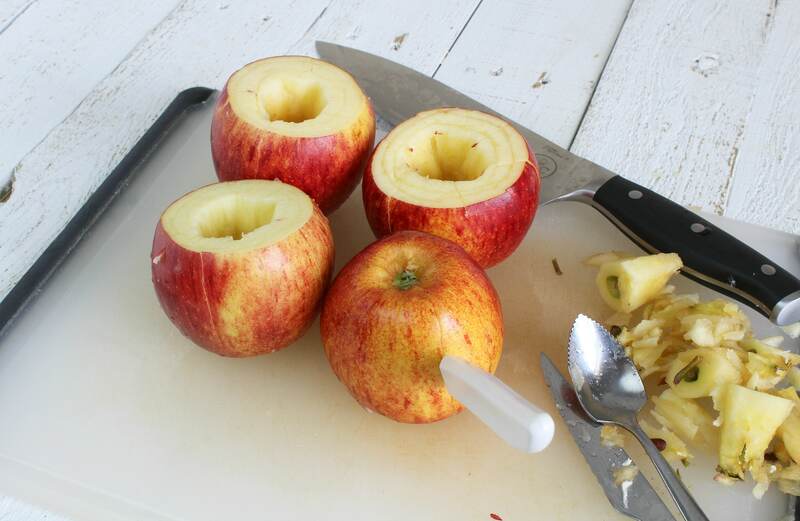 Cover the entire tops of the apples, not just filling the core of the apple. Bake prepared apples at 375F for 45 minutes or until apples are soft. 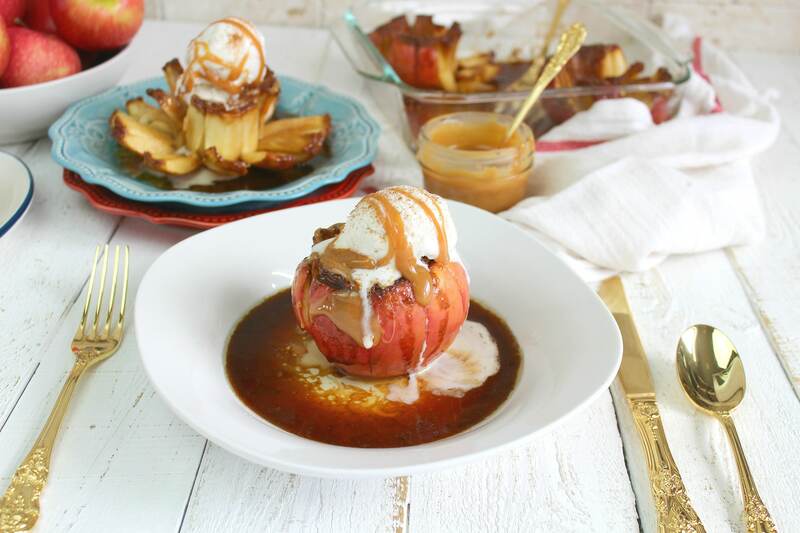 Let apples cool slightly and top with a scoop of ice cream and drizzle with caramel sauce if desired. The size of the apples will vary the cooking time. The recipe is done when the slices of apple are very soft. Yummy! I love apples but generally eat them as they are. Definitely as the weather cools I start thinking of apple crisp and other things I can bake using apples. Thanks for sharing! I’ve never made these but they look delicious and simple to make. I love warm apple pie with vanilla ice cream. 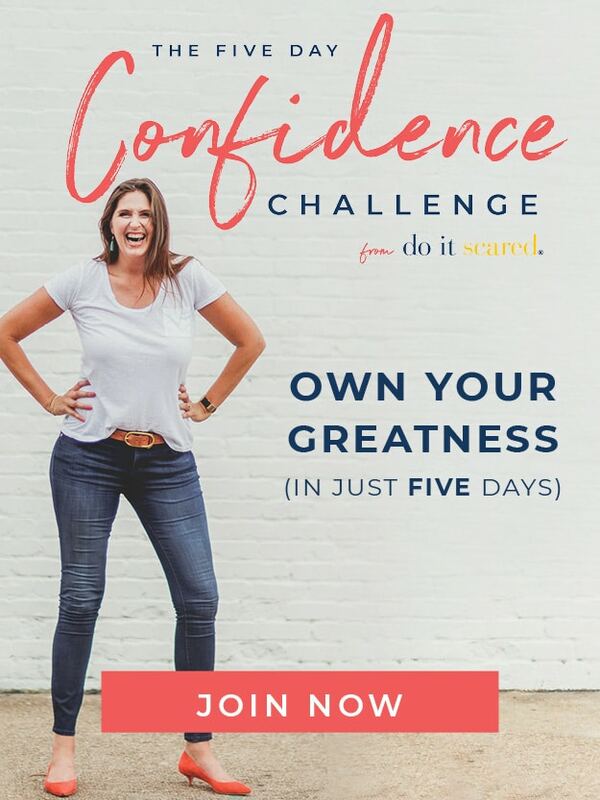 I’ll have to try this one for sure. Thanks for the recipe! The cake you share is delicious and beautiful. This was so incredibly yummy! What’s more, I don’t especially like apples! It was easier than I thought it would be, and my family couldn’t quit discussing it. We will definitely be making this this again. Thanks so much! It is nevertheless increased at the chance of intense exaggeration by means of its supporters; even as when the tables turn, the other phenomenon happens. Oh! My! 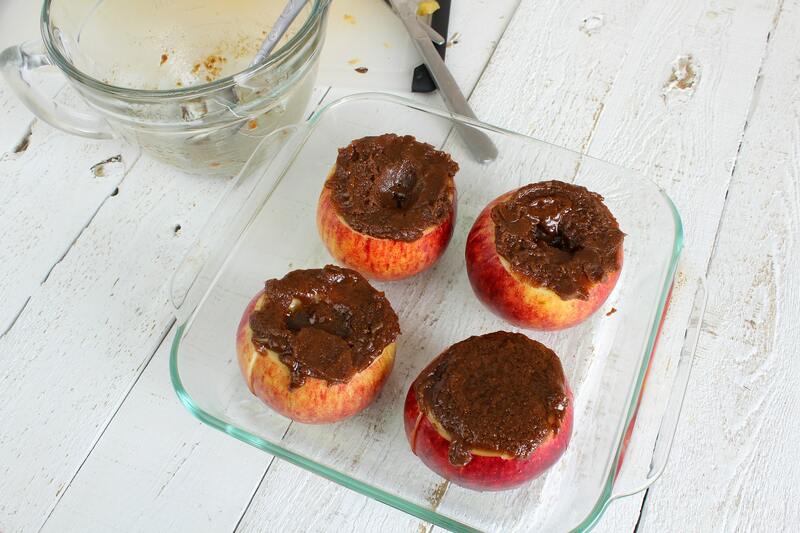 This looks delicious and I love that you used coconut sugar! Just shared the recipe with a friend. 🙂 I read your book about blogging Ruth. Thank you SO much! It’s helped me. I was going to share that with a friend too, but it’s too much like a textbook for me right now, so I bought her a copy. LOL Thanks so much! Keep up the good work and Merry Christmas! 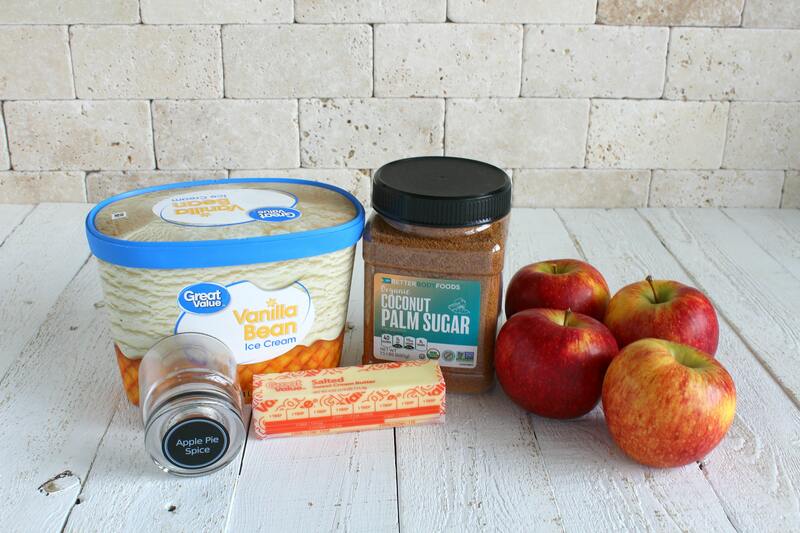 There is simply something about apples and apple pie spice inside the fall that makes my heart sing. I love all the seasons right here in South Dakota, but my favored is fall. The weather, the colors, and the flavors are some thing I look forward to all 12 months. Yummy! I love apples but commonly devour them as they’re. Definitely as the weather cools I start taking into account apple crisp and different things I can bake the usage of apples. Thanks for sharing! I love apple pie so muuch! This one looks very delicious. 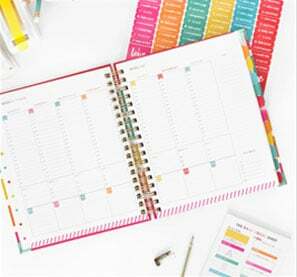 I found that site very useful for me.